Is there an entrance fee for spectators? No, free entry to all. can Spectators camp on the grounds? Is There a GROUNDS MAP? 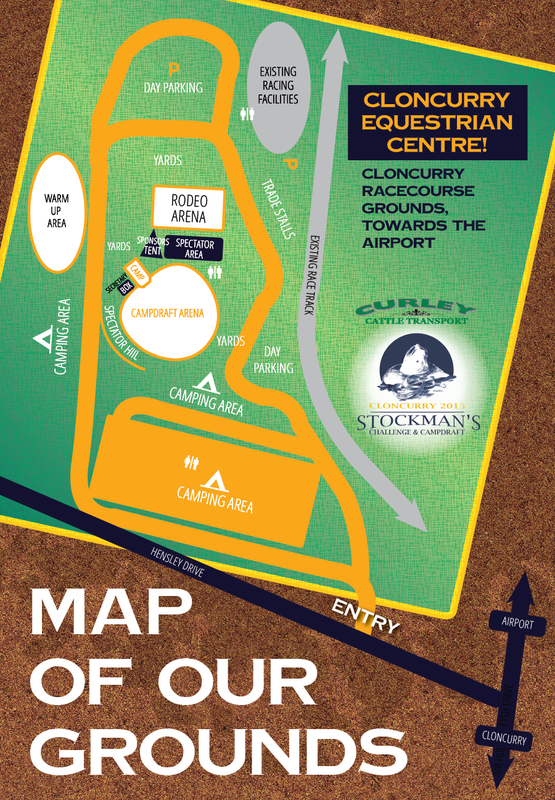 when can Competitors access the campground? Spraying will be available on the grounds at users cost. Where can I get Horse Feed? How do I change my Nomination? Any changes to runs must be made no later than one hour before the event starts - at the Secretary's office. Any changes that are not made at the office first will be scratched automatically. NB Only changes received by hard copy will be accepted over the course of the weekend. Forms will be available at the Secretary's office; no changes made by text will be accepted. Horses are to run in the order they are drawn (as nominated by you). All efforts are made to minimise clashes in nominations between Arenas, but not every run can be catered for. In the event that you do happen to have nominations that clash, Challenge events have precedence. Any clashes must be reported to the Marshalling Steward of the Arena affected. Failure to do so will mean an automatic scratching. If a run is missed due to a clash, on verification from the Steward, the nomination will be run at the end of the event affected. We thank you for your support and understanding in this matter. We are here to run the event for your enjoyment and appreciate your assistance.